I had the unique opportunity this past weekend to visit Dr. Charles Runels in beautiful Fairhope, Alabama. 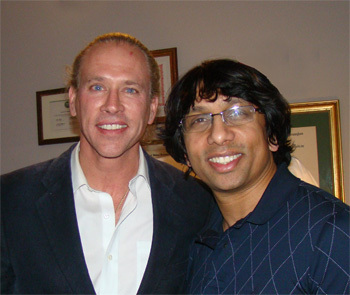 Dr. Runels is the creator of the famous “Vampire Facelift (TM)”. The day with Dr. Runels and his assistant Laura left me with a great impression. Many of my colleagues perceive Dr. Runels from his videos and website as being a “fringe” physician. Nothing could be further from the truth. Although his personal style (which is seen on his YouTube videos) and passionate desire to protect the quality of his creation “The Vampire Facelift (TM) can be interpreted as “strange”, my feeling is that he is an exceptionally creative and caring physician whose mission is help people live life to their fullest potential. He was very gracious and specific in instructing me on how to perform the Vampire Facelift (TM) which is a method to enhance areas of the face which are sunken using hyaluronic acid (such as Juvederm and Restylane) and your own blood’s growth factors (drawn like you would for a routine blood test) which are processed into something called “PRP or Platelet Rich Plasma”. This combination as designed by Dr. Runels is very safe and creates instant results with typically no downtime. The clients of Dr. Runels I met at his office were huge fans of the procedure and could not say enough about how happy they were. In unapologetic Southern style, one client said “I’d follow Dr. Runels anywhere for my Vampire Facelift!” (the accent and voice made the phrase unforgettable). The idea of using your own blood to create a youthful appearance is a concept which has great appeal to many of our clients who have heard about the “Vampire Facelift (TM) on the TV show “The Doctors”. My wife and I enjoyed a very educational day with Dr. Runels and Laura with only a little time to enjoy the beauty of Fairhope. We did have a wonderful dinner at Camellia Cafe with them and I have to say the service and food was on par with top Manhattan restaurants we’ve been to. Just in time for Halloween, the “Vampire Facelift (TM)” is now a procedure we are offering at our offices in Manhattan and Garden City, Long Island. Once again, I want to acknowledge Dr. Runels for his creativity and passion and thank him for his instruction and hospitality.